I’ve been wanting to try something new with amigurumi, so I bought a pack of 7-inch black zippers on Amazon the other day. The result of my first attempt with zippers is this adorable little frog. 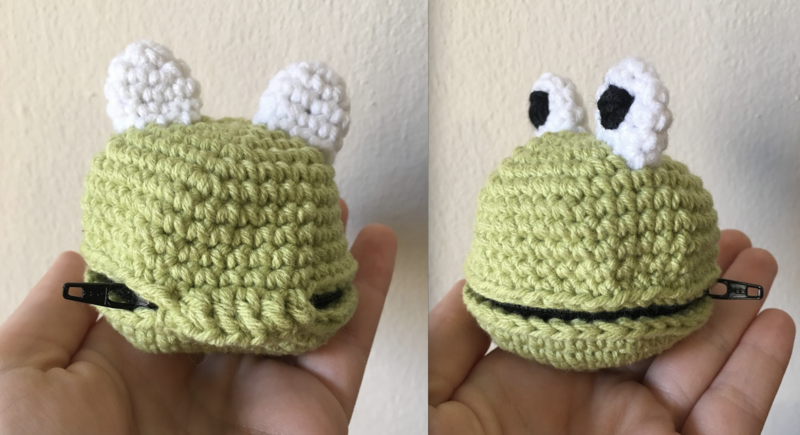 He’s so simple to make, he didn’t involve any frogging at all (hehe). R3-4: sc around (9). Fasten off and lightly flatten the piece. Create the pupils by sewing black yarn or thread over a circular area on one side. Next we’ll attach the zipper. 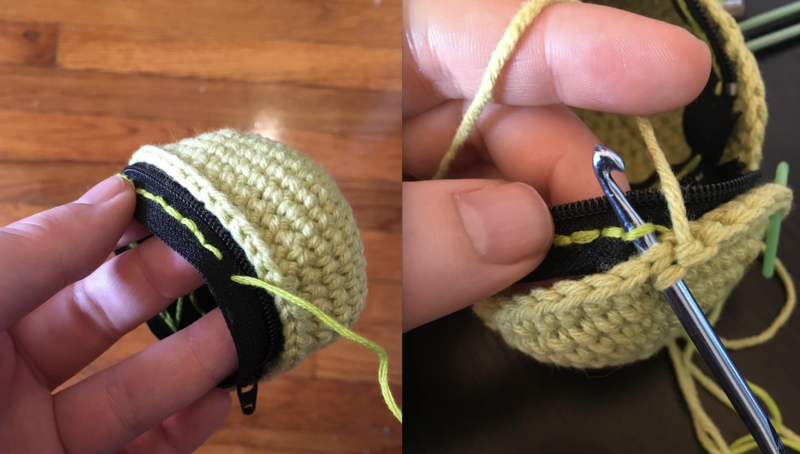 Wrap your zipper into a circle, overlapping the ends so that it just fits inside your crocheted piece. Sew or hot glue the ends together. Then, prepare the zipper for crochet by taking thread or embroidery floss and stitching 36 sewn stitches around the edge of the zipper with a needle, starting just before the zipper pull and ending shortly after the zipper stopper. You can see in the photo below on the left how I have stitches around the zipper with embroidery floss. You’ll want to do this about 2mm above the zipper then sew another set 2 mm below the zipper. For the next round you’ll insert your hook through both the stitch AND through a stitch on your zipper (see the photo above on the right), starting just before the zipper pull. Through both, sc 36. Next we’ll make a little tab to cover the back of the zipper, where you either sewed or hot glued it into a ring. In the last 6 stitches (NOT through any stitches on the zipper, just in your crochet stitches), work as follows: ch. 2, skip 1 stitch, dc in next 4, ch. 2, sl st to the last stitch. Then fasten off. Weave in your ends, attach the eyes (or any other embellishments you’re using) then you’re all set! Thank you for the adorable pattern..
You are very welcome, I’m so glad you like it!